Official promotional banner of the Moto X. If you don’t already know, the design of the Moto X is very similar to that of its younger sibling, Moto G. It only bears a slightly larger 4.7″ display, which is an AMOLED unit instead of IPS. The Moto X comes with unique software and hardware features, like always-on voice commands, twist to launch camera, active display and many more which are not seen on any other device. Clearly, Motorola’s focus was on the user experience side more than just the ‘raw hardware specs’ side. It’s understandable that they were “obsessively involved” in the optimization of the almost-stock Android ROM for their Moto X. Ohh, and it’s worth mentioning that the Moto X is likely to come with Android 4.4.2 KitKat on board. On the hardware side, you get a custom SoC calls ‘Motorola X8 Mobile Computing System’ which contains a dual-core 1.7GHz Krait processor, a quad-core Adreno 320 GPU, one contextual computing core, and a natural language processing core. So, that’s 8 cores in total! You also get a 10MP camera on the back with larger-than-usual pixel size for better image quality in low-light conditions, and a 2MP front-shooter. There’s 2GB of RAM and a 2,200 mAh battery. The display is a 4.7″ HD (1280×720) AMOLED display (312ppi) unit with Corning Gorilla Glass protection on top. 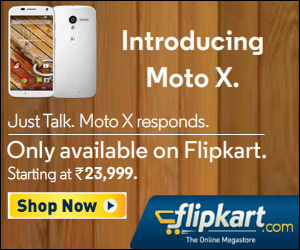 Check out the official product page of Moto X on Flipkart.